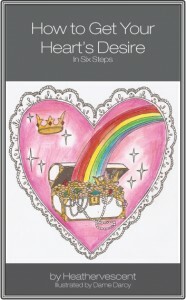 How to Get Your Heart’s Desire is an easy and effective guide to achieving what you want in life in Six simple steps. Written by and based on the experience of Heather Schlegel, an internet strategist and former product manager at AOL, this interactive journey encourages readers to look within themselves through suggested daily practices and rituals that ultimately ensure the manifestation of our deepest desires. Most importantly, it provides all this in a practical and tangible manner. Available on Amazon Kindle Store. Based on not one, but a diverse compilation of proven methods that date back thousands of years, it has been inspired by the teachings of people ranging from Steven Pressfield to Carlos Castaneda. With the light-hearted illustrations of artist Dame Darcy to go along with a fast-paced and easy text, How To Get Your Heart’s Desire is the perfect book to keep in your back pocket. Heathervescent aka Heather Schlegel has been consciously living her dream life since 2005, although the dream is constantly changing. She is a writer, an internet strategist, a marketer, an organizer, a philosopher, a researcher and an agent of Cacophony. You can follow her adventures at www.heathervescent.com. She lives in Hollywood, California. A Renaissance woman, Dame Darcy is a prolific artist, animator, illustrator and musician. Her publications include Frightful Fairytales, The Illustrated Jane Eyre and Gasoline. Visit www.damedarcy.com for her latest projects.